Mark Millar writes big blockbuster comics like Michael Bay made big, dumb, fun action movies in the ’90s. The fact that Nemesis is big and fun does not mean that it is also dumb. Far from it. It has a wicked sense of humour, aided by the fantastic Steve McNiven on art. Millar & McNiven last teamed up for the superb ‘Old Man Logan’. They are a great partnership. Nemesis will not alter this fact. 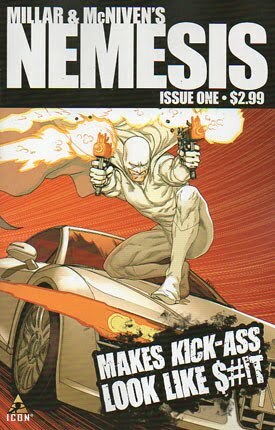 Nemesis is breathless, action-packed, fun and funny, with some superb action sequences, a truly monstrous and evil bad-guy and an opponent up for the fight. This is a great opening issue. What’s the betting we see this out in the cinemas in 2012? Finally – after a year, and numerous delays between each issue, and none longer than the wait for this finale – we get to the conclusion of Old Man Logan. It does not disappoint. The saying goes that ‘revenge is a dish best served cold’, but to be honest, I prefer my revenge fiction to be played out in the heat of anger and rage, subsuming the grief by spilling the blood of the enemy, smiting the perpetrators. 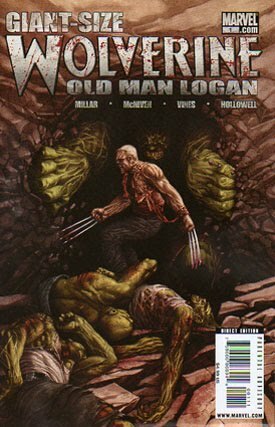 Logan does a lot of this in this oversize edition, as he takes out the dreadful progeny of Bruce Banner in a post-apocalyptic hell where all the Heroes are dead, and the innocent are prey to the hunger and desires of the corrupted. The pages are awash with the slashing fury of Wolverine as the panels are sprayed with blood, like a Lone Wolf and Cub movie transferred to blood soaked print. The influences abound – you can see the debt to the Spaghetti Western, to Mad Max, to Lone Wolf and Cub. The fact is though, that it takes all these influences and makes the story one of the better Wolverine stories, and that is a considerable compliment when you consider the sheer weight of stories about this character that have been produced in the last 25 years. Old Man Logan is fun, furious, bloody and brutal. It’s like the best B-Movie revenge thriller that was never made (think Mad Max 2 meets The Exterminator) and I will be getting the Hardcover collection of this when it gets released towards the end of the year. Apart from the disjointed release schedule, Old Man Logan has been a total success as far as I am concerned, and this final issue did justice to the tale as a whole, which was something of a relief, and made for a fearsome few minutes of reading. Finally, Mark Millar has written a great revenge tale and a re imagining of the Wolverine story, but thanks and tributes have to go to McNiven (pencils), Vines and Morales (inkers) and Hollowell (colours) – your work was splendid, bringing life to this tale with your vision of a fallen America.